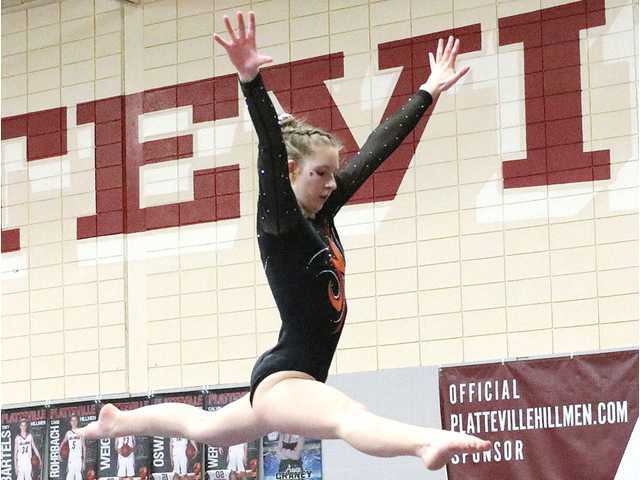 POSTED February 27, 2019 12:58 p.m.
PLATTEVILLE — It took an entire team effort, but the Platteville/Belmont/Lancaster gymnastics team is heading back to the WIAA State Championships as a team. The Hillmen finished second at Saturday’s eight-team Division 2 Platteville Sectional with a combined score of 129.05 edging out SWC rival River Valley (126.625) for the final state team berth. Dodgeville/Mineral Point won the sectional team title with a score of 132.9. The top two teams at sectionals advance to the WIAA D2 Team State Championships that will be held Friday at 2 p.m. at Wisconsin Rapids Lincoln High School. The Hillmen trailed River Valley by a point after three rotations, heading into their final event, but P/B/L turned in a solid team score on the balance beam to pass the Blackhawks, who struggled on the uneven. “The day of the meet was exhilarating. When looking at the team during march-in, I could tell they were ready,” said Hillmen head coach Jessica Hill. “After completing beam all the team could do was watch and wait while River Valley competed on their final event. As we watched River Valley/Barneveld move though their line-up on bars, it became evident we would earn a berth at the state meet. Platteville/Belmont/Lancaster qualified for the Team State Championships seven straight years from 2010–16, finishing second in 2011 and third in both 2010 and 2013. Three Hillmen also earned a berth in Saturday’s WIAA D2 Individual State Championship, that will be held Saturday beginning at 11:30 a.m., by virtue of top-five finishes at Saturday’s Platteville Sectional. Junior Lizzy Haag placed fifth on the uneven bars with a score of 8.05. Haag qualified for individual state on the bars two years ago as a sophomore. Sophomore Brooklyn VanNatta finished fifth on the vault (8.4525) and just missed state berths in the all-around (32.45) and the floor exercise (8.525), placing sixth in both. Freshman Hailey Jentz (8.525) edged Wolf (8.475) for fifth place on the balance to earn first individual state berth. “At the beginning of the season it was evident the gymnasts were talented and capable of making it to state,” said Hillmen head coach Jessica Hill. “Lindsey Wolf and Lizzy Haag made getting to state the team goal. They were the two gymnasts on the team who had been there previously as freshmen and were determined to return. Team scores — 1.Dodgeville/Mineral Point 132.9, 2.Platteville/Belmont/Lancaster 129.05, 3.River Valley/Barneveld 126.625, 4.Viroqua 126.475, 5.Southwestern/Benton/Cuba City 120.8, 6.Reedsburg 110.40, 7.Westby 108.8, 8.Prairie du Chien 101.825. All-around — 6.Brooklyn VanNatta 32.45, 8.Lindsey Wolf 32.2, 11.Katrina Stastny 31.5, 12.Hailey Jentz 31.10. Floor exercise — 6.VanNatta 8.525, 7.Wolf 8.5, 11.Stastny 8.35, 12(tie).Hailey Doyle 8.25, 26.Jentz 7.575. Vault — 5.VanNatta 8.425, 9(tie).Wolf 8.125, 11.Jentz 8.075, 24.Stastny 7.70. Uneven bars — 5.Lizzy Haag 8.05, 7.Stastny 7.85, 10.VanNatta 7.55, 15.Wolf 7.1, 20.Jentz 6.925. Balance beam — 5.Jentz 8.525, 6.Wolf 8.475, 9.VanNatta 7.95, 15(tie).Stastny 7.6, 21.Hailey Doyle 7.15.